Well here we’re again another failed relationship. He sold you the game how he was different from the other men you dated in the past, and in a way he was different from men in your past but just like them he wasn’t ready for a relationship. Now, you’re blaming yourself like why you keep meeting the same kind of men or you're blaming the city that you live in. And how men of today have a commitment problem. Which is all true…….in a way one night last year, I went on a date with myself and it changed my life. 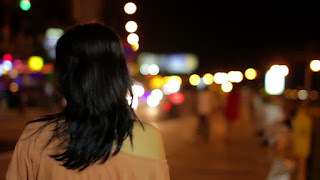 That night, I overcame a huge personal fear of mine: ending up alone. As you know last year I had been dating a guy for a steady period of time when he decided to call it quits. Then I dated someone else shortly after and four month later we called quit. I was devastated getting dumped twice in one year it fucks with me emotionally and I was really hurt until I caught myself throwing an pity party and I didn't like it. At that moment, I decided one night I'd take the initiative and do something completely different that I had never done before; I'd go on a date with myself. Other day I was listening to this one guy saying that the reason why we have so many failed relationship as women because we listen with our mind instead of our heart. We jump in head first just to drown in a sea of self-pity when things doesn’t work out. And as my mother used to tell me it’s only so many times you can blame a man for what happen when you have another failed relationship, you have to take some blame in what happen between you two. Furthermore, that why now I see the beauty in dating yourself first before getting into another relationship it cut down the heartbreak and you will finally learn what you need in order to be in a happy relationship. No man can heal your broken heart until you heal it yourself first no matter how you try to avoid it. I remember that night like it was yesterday. I was so nervous because this would be my first time going to the movies by myself. I would always go with my big sister and her husband or beg one of my little sisters or brothers to go with me or called one of my four friends to go with me. It was an act that I was always too prideful to do before because I didn’t want the world to know that I was single. I was excited to finally overcome my fear of being alone in a normal day to day activity. I arrived on time as if I were on a real date, I bought my ticket and grabbed a seat toward the back cause I didn’t want anyone I know to see me (I couldn’t help it this was new to me at the time). My snacks were beside me, where one of my ex would've sat. I started to panic when I looked around and saw the theater was filled with couples on dates looking all happy, and in love but I quickly corrected my thoughts and reminded myself that I was on a date as well — just with myself. If you only depend solely on men to find your happiness, then you'll be greatly disappointed in the end. But, if you take a small portion of your time and dedicate it strictly to finding yourself and focus solely on spending time with yourself, then you'll slowly find that inner peace that you been relying on men to find for you. As I reevaluate my history with men, I can finally acknowledge that I was afraid of ending up alone. I was always searching for another soul to give me the confirmation that I wouldn't end up alone, but after that night, I was finally on a date with “someone” who made me realize that I don't need a man to make me feel worthy cause I was already worthy I just needed to see it for myself. I use that period of my life to heal myself from all the broken pieces that I've suffered from after all my failed relationships and I found that inner peace I been searching for. I've realized that only putting on a Band-Aid every time I had a gash isn't the best way to heal the cut that was on my knee. I needed to first clean up the wound, disinfect the area, add ointment to the injury, then wrap a Band-Aid around myself. There are many steps towards healing yourself, yet I was too impatient nor was I in a rush to do them . I sought for quick resolutions which is why I jumped into another relationship with a man that I knew wasn’t good enough for me, in which it only delayed the healing process for me in the end. Just as it takes steps and time for a physical wound to heal, the same applies for emotional wounds as well. The best way for anyone to heal from a broken heart is to redirect that energy toward yourself, not your exes or the wrong people who entered your life in your time of weakness. Only you who ultimately has the power to control the destiny of your happiness. I know going on a date with yourself sounds crazy but it’s the date that will lead you to your true happiness and begin that journey of moving on with your life. If you don’t learn how to be alone now then you will always meet those rotten apples that will always lead a bitter taste in your mouth……...But what do I know I just here to drop some knowledge while I’m on my journey of self.